These are lyrics by Red Hot Chili Peppers that we think are kind of repetitive. 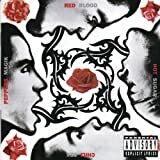 Red Hot Chili Peppers', "Give It Away"
In the song the words 'give it away' are said 63 times in the song. Red Hot Chili Peppers', "You always sing the same"